There are situations where overlapping objects on the label design is important. Printing an inverted barcode on top of a black background (i.e. other solid black shape object) is a good example. 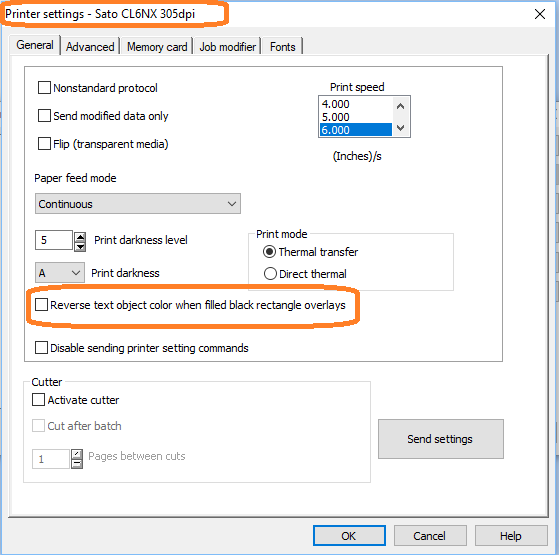 This article explains how driver settings for all TEKLYNX label design and printing software products (e.g. CODESOFT, LABEL MATRIX, and LABELVIEW) may influence how effectively these objects overlap with each other. A sold black or dark color object is partially overlaid by other objects, the overlaid object becomes invisible (same color as the dark object). This problem appears to be related to TEKLYNX printer drivers. 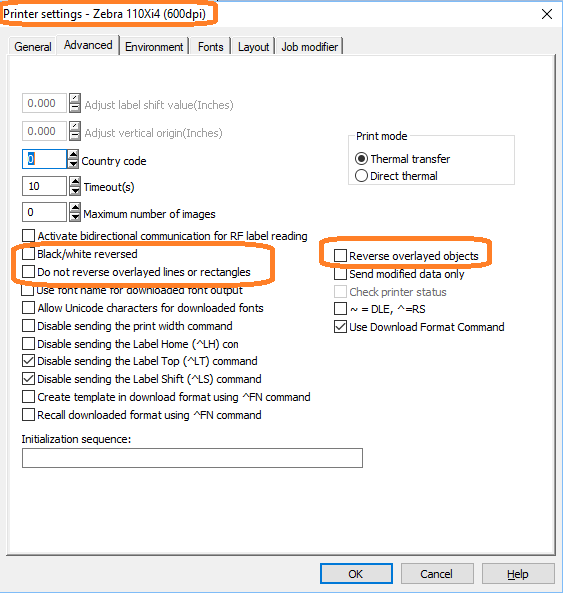 TEKLYNX printer drivers do not appear to respect the overlapping (front to back or back to front) of different objects when shape objects are involved. When a TEKLYNX driver is selected, shape objects (e.g. Rectangles, Circle/Ellipse, Polygon, Line, and Extended Objects) will be layered on top regardless of how the label was constructed. Thus objects layered on top of a shape object will appear to be layered under and be partially or completely hidden from view. Changing to the Windows Driver is the most direct and simplest approach. The Windows drivers seem to respect the layers defined by the user in the software. 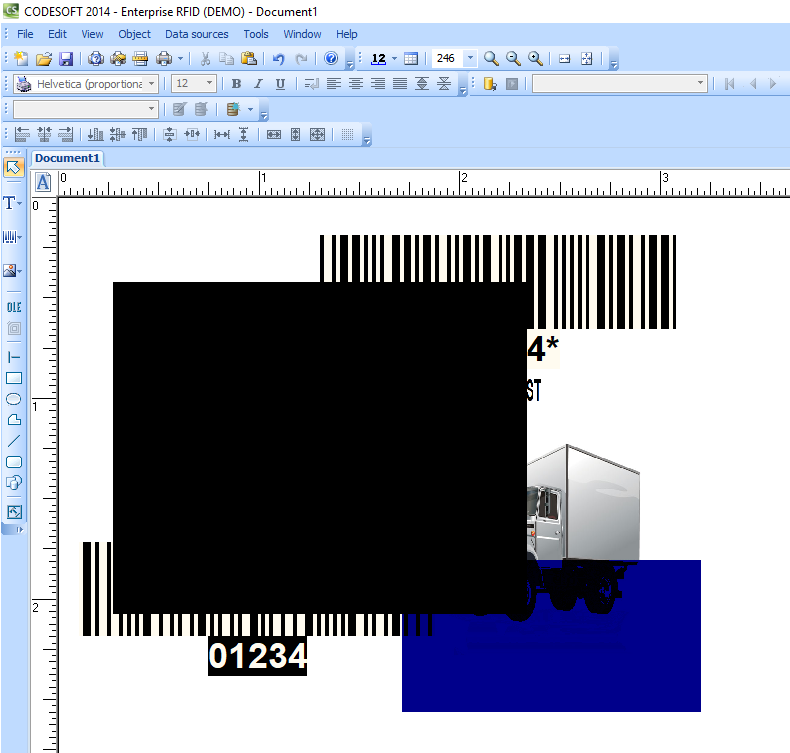 However, the Windows drivers will not automatically reverse the line and spaces in barcode symbols. Thus if you put a barcode on top of a black background object, the barcode will likely NOT be readable. To make this work, you need to reverse the lines and spaces within the software and, if using a printer font for the human readable, a windows font will need to be selected. The approach requires more knowledge of the printer features. With TEKLYNX drivers, you can exercise greater control over embedded printer features. 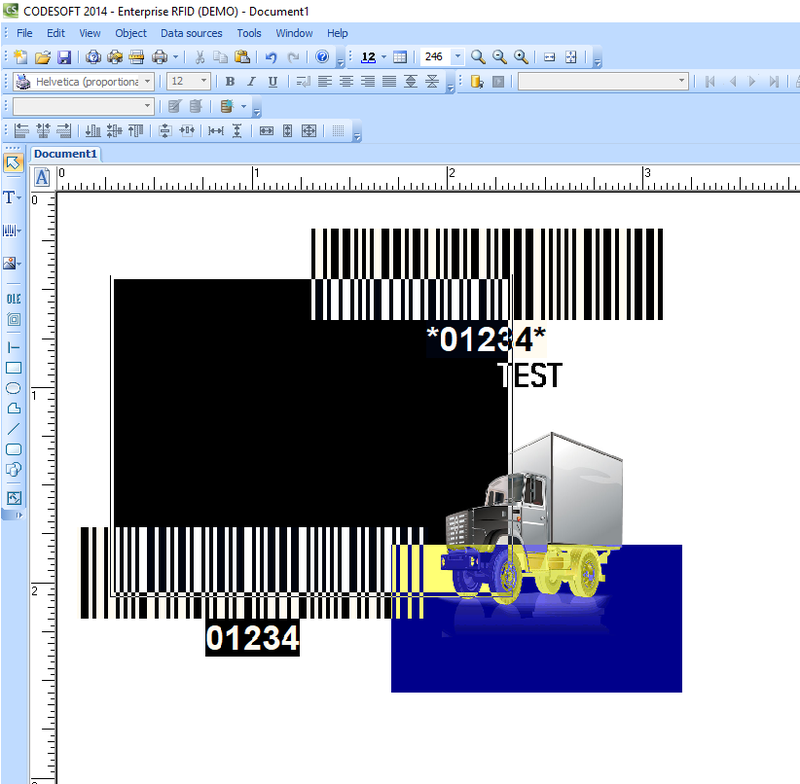 For example, if using the TEKLYNX driver for the Zebra 110Xi4 (below), you can select the “Reverse Overlayed Objects” feature to make the barcode AND human readable appear correctly. This feature not only reverses the lines and spaces (as required with the Windows drivers) but also adjust the human readable. 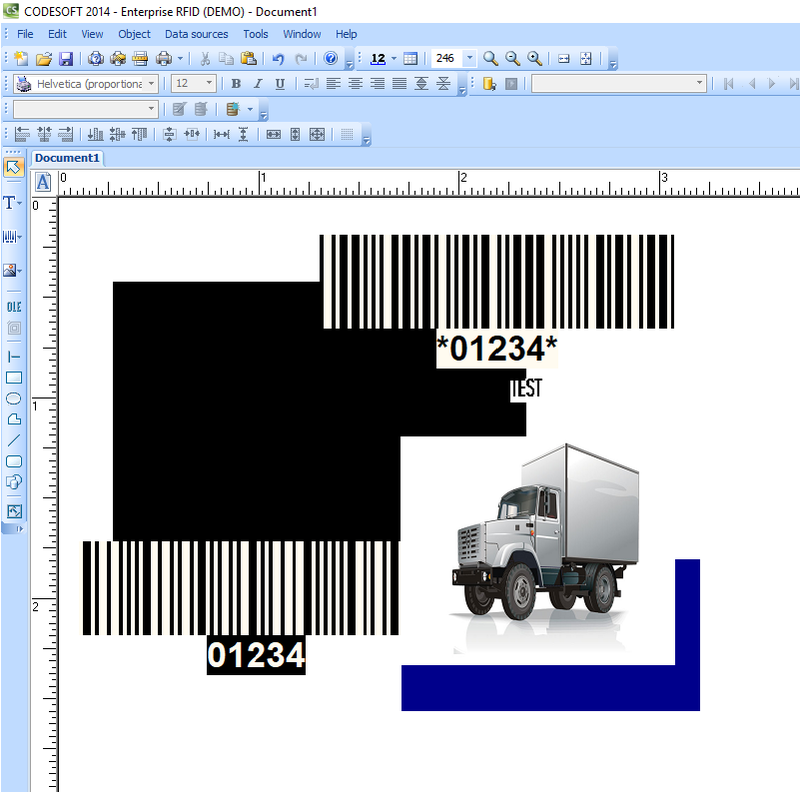 Unlike when using the Windows driver, this features will produce readable barcode without manually making changes or changing fonts. These setting may have many different names, so you have to carefully check the available options available to you for each driver. This may be the simplest method. To enable this feature, from the menu, select File > Properties and select Extended from the icon on the left side. 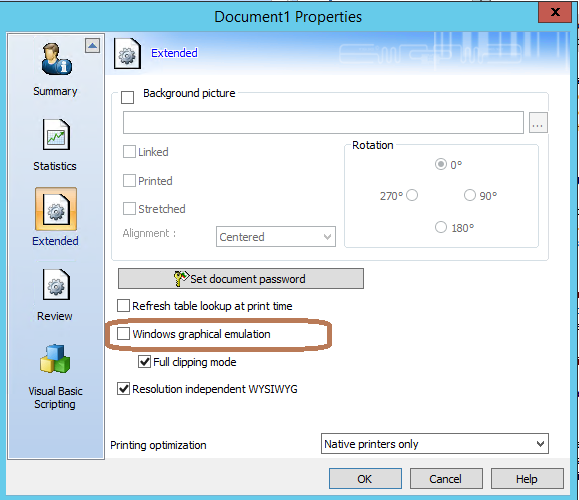 Check the Windows graphical emulation box. This feature will force the software to generate the output in a graphic form (instead of printer commands). The downside of this feature is the computer has to transfer a larger set of data to printer. In many cases, this is not an issue. If you are printing labels a large quantity and at high speed, this feature may slow down the printing.